We’d love your help. 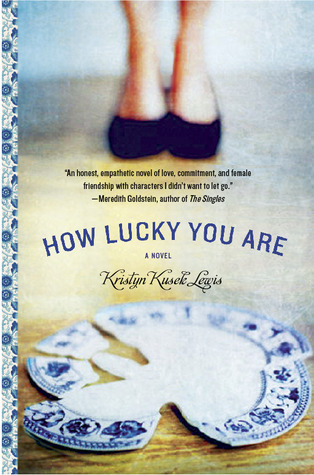 Let us know what’s wrong with this preview of How Lucky You Are by Kristyn Kusek Lewis. In the tradition of Emily Giffin and Marisa de los Santos, How Lucky You Are is an engaging and moving novel about three women struggling to keep their longstanding friendship alive. Waverly, who's always been the group's anchor, runs a cozy bakery but worries each month about her mounting debt. Kate is married to a man who's on track to be the next governor of Virginia, b In the tradition of Emily Giffin and Marisa de los Santos, How Lucky You Are is an engaging and moving novel about three women struggling to keep their longstanding friendship alive. Waverly, who's always been the group's anchor, runs a cozy bakery but worries each month about her mounting debt. Kate is married to a man who's on track to be the next governor of Virginia, but the larger questions brewing in their future are unsettling her. Stay-at-home mom Amy has a perfect life on paper, but as the horrific secret she's keeping from her friends threatens to reveal itself, she panics. To ask other readers questions about How Lucky You Are, please sign up. Sounds good, do you like it? I'm trying to figure out how to describe how I feel about this book without giving too much away. I've been staring at my screen for a bit with no luck, so I'm just going to jump right in. How Lucky You Are is a story of perception and truth and friendship. Waverly, Kate, and Amy are three friends who know everything about each other, except for the secrets each one manages to keep. We are all guilty of it, seeing friends or neighbors and comparing our lives to theirs...the perfectly manicured l I'm trying to figure out how to describe how I feel about this book without giving too much away. I've been staring at my screen for a bit with no luck, so I'm just going to jump right in. How Lucky You Are is a story of perception and truth and friendship. Waverly, Kate, and Amy are three friends who know everything about each other, except for the secrets each one manages to keep. We are all guilty of it, seeing friends or neighbors and comparing our lives to theirs...the perfectly manicured lawns, the children playing quietly together, the vacations...wondering how they got so lucky. Why do we keep the truth from the people we love? If they are such good friends, why can't we be honest? Why are we ashamed? Why is it so hard to ask for help? If you can't rely on your friends, what do you have? But when the secrets inevitably start to come out, that's when you figure out what is truly important. I feel like my review is lacking, but it truly is one of those books where you read it and nod and agree and "get it". I don't typically read books like this, sticking to my YA and erotica because I read to escape and the "problems" in those books don't usually hit close to home, but I'm so glad I read this one. It made me appreciate my chaotic household a little bit more and also reminded me that I have a few friends to call. I'm lucky to have them. LOVED THIS! I was so invested in all of these characters. I loved the bakery aspect, I loved all the scenes there. I had quite a few feelings throughout. This is the kind of contemporary novel that I enjoy. I’m always drawn to stories about groups of women friends - how does the author portray close friendships? Is the dialogue realistic? Does it ‘ring true?’ Therefore, I picked up How Lucky You Are by Krisyn Kusek Lewis with great hopes. It’s the story of Waverly, Kate and Amy, a tight-knit trio who met in their early twenties. The story is told from Waverley’s perspective who, after years of being the ‘rock’, is feeling the strain. Waverley is facing financial ruin and the loss of her home and bus I’m always drawn to stories about groups of women friends - how does the author portray close friendships? Is the dialogue realistic? Does it ‘ring true?’ Therefore, I picked up How Lucky You Are by Krisyn Kusek Lewis with great hopes. It’s the story of Waverly, Kate and Amy, a tight-knit trio who met in their early twenties. The story is told from Waverley’s perspective who, after years of being the ‘rock’, is feeling the strain. Waverley is facing financial ruin and the loss of her home and business and meanwhile Kate and Amy are dealing with serious struggles of their own. I won’t reveal what these ‘serious struggles’ are (although it doesn’t take much imagination to come up with possible conflicts married women may experience). Needless to say, I guessed what was going on quite early in the book. The jacket blurb promised that Waverley would “…discover that there’s a fine line between loyalty and betrayal. And sometimes life is about taking risks in order to get the rewards you crave…”. Well, having just finished the book, I’m wondering if I missed something. Waverley didn’t really face any major loyalty/ betrayal decisions. True, she wasn’t completely honest with her own partner, Larry, but I didn’t get a sense of moral dilemma and nor did I ponder what I’d do in similar circumstances. So it lacked a bit of punch. What about the friendships? I’m afraid it was a bit blah. The dialogue was nicely done but the lack of other friendships in the three women’s lives plus the fact that Amy and Kate imply that they only hang out together because of Waverley, left me feeling unconvinced. One thing that irritates the hell out of me is an overdone ‘back story’ – the reader is introduced to the characters and their current situation and then the author goes into rewind, with page after page of what happened previously. I understand that a degree of this is unavoidable but back story can be revealed as vignettes, allowing the reader to fill in the gaps. There was far too much back story and justification of characters in How Lucky You Are. 2/5 I guess I like my chick-lit a bit sparklier, a bit more frivolous. Three friends...three different lives...three separate sets of issues. Wow...loved this book. We have three very different women who have been friends for a long time. Kate is wealthy, Amy is a happy mom and Waverly owns a bakery. On the surface their lives seem happy and fulfilled. Behind closed doors each woman is dealing with major issues. Waverly seems to be the worrier...the friend who tries to keep everything running smoothly. I am not going to share too much about this book. The author has a lovely way of letting each secret unfold. That is one of the most enchanting parts of this novel. You will laugh and cry and want to kick a wall in while reading this book...it is that wonderful! Doughnut muffins, getaways with friends, relationship angst, frustrating and giving women...I loved all of it! The ending!!! I was so into this book that I could not believe it when I flipped to the last page! If friendship and bonding and really important life changing issues are your thing...you will love and adore this book! While I finished the book and it was okay, I didn't like any of the characters: Waverly, the narrator, because everything that happened seemed like she made it about HER; Kate, because her repetitive rich-girl whining nearly made me give up on the book before I was halfway through; and Amy, because she was colorless. I couldn't believe that these old friends, especially Kate and Waverly, being friends longer, couldn't seem to really talk about what was happening with their lives until a near-tra While I finished the book and it was okay, I didn't like any of the characters: Waverly, the narrator, because everything that happened seemed like she made it about HER; Kate, because her repetitive rich-girl whining nearly made me give up on the book before I was halfway through; and Amy, because she was colorless. I couldn't believe that these old friends, especially Kate and Waverly, being friends longer, couldn't seem to really talk about what was happening with their lives until a near-tragedy happens. What kind of "best friends" are these if they can't tell each other what's really going on? (except, I can excuse Amy.) And I especially couldn't believe that Waverly kept so much from her partner of ten years, who seemed like the nicest guy on the planet. Waverly and Kate have been best friends since they were teenagers, and they became friends with Amy when they were twenty-two, and had just graduated from college. Thirteen years later, they are still friends. Amy and Kate are both married, and Waverly has been dating Larry for six years. Waverly owns a bakery, and is having financial trouble, Kate’s husband is running for governor of Virginia, and Amy is a stay-at-home mom. They are all having problems in their relationships, and they aren’t re Waverly and Kate have been best friends since they were teenagers, and they became friends with Amy when they were twenty-two, and had just graduated from college. Thirteen years later, they are still friends. Amy and Kate are both married, and Waverly has been dating Larry for six years. Waverly owns a bakery, and is having financial trouble, Kate’s husband is running for governor of Virginia, and Amy is a stay-at-home mom. They are all having problems in their relationships, and they aren’t really talking to each other anymore, at least not about anything important. Every time Waverly tries to talk to one of her friends about her problems, they are too preoccupied with their own lives to listen. But, suddenly things happen to both Amy and Kate that make her realize how good she has it. She thought her friends had perfect lives, but she had no idea how bad things really were for them. This book was really hard to read, because it is so emotional. I was in tears throughout the last half of it. I really identified with all three women. It is a great book about friendship, and shows that things aren’t always they way they seem. I couldn't put this book down once I started reading it. I even read late into the night and finally finished it before work this morning. The main character, Waverly is a woman we can all relate to. She feels inferior to her friends, that she hasn't "grown up" yet, and when she gets so stressed out she hides from the issue (like bills). One of her friends is a woman from a wealthy family, whom she is jealous of the money and the beauty. Then her other friend marries a doctor, has a child and settles down in the suburbs. Wavery is sinking under a mountain of debt and she can't seem to appreciate what she does have. When things start coming apart for her friends, she realizes what she nearly lost. She works on her getting own life together, even as she is helping her girlfriends. This struck me as very realistic. Our lives aren't running a single story-line, we have as many things pulling at us as we allow. Friends, family, work, children, even school. All that goes on simultaneously and the author did a fantastic job capturing that. I cherished every minute of reading this book, and the story at the root of it, was totally shocking, so I will not give it away. Definitely put this on your “Must Read List”! Three close friends are going through secret struggles that bring each of them facing one of life’s big questions? Just, How Lucky am I? It is as simple as that. While Waverly has the steady live-in boyfriend that treats her perfectly, she is harboring secrets about her Bakery business because she is scared of the consequenc I cherished every minute of reading this book, and the story at the root of it, was totally shocking, so I will not give it away. Definitely put this on your “Must Read List”! While Waverly has the steady live-in boyfriend that treats her perfectly, she is harboring secrets about her Bakery business because she is scared of the consequences that might ensue should she speak a word of them. Waverly and Larry do discuss getting married; having kids, but stop when the conversation gets too deep. It is like they have a line in the sand they are scared to cross in that discussion. Because of this, Waverly thinks her two closest friends must have it better! Then, there is Amy who is married to Mike and has a lovely daughter, Emma. They live the American dream; all they are missing is white picket fence and the dog! She too is holding on to a secret from everyone she loves. She is worried of the consequences, as well. From the outside Amy is perfection to her friends, but Amy thinks they have it better! And, there is Kate, who is strong, always well-dressed, and perfect in everyone’s eyes. Her Husband Brendan is running for the Governor for the State of Virginia, and there are certainly a lot of perks that come along with that, right? Great tables at restaurants, the fanciest of clothing, meeting such affluent citizens. I mean, she must have it better than Amy and Waverly put together. At least that is what they think? Looking at someone’s life from the outside, no matter how close you think you are to them, is so different than really being in their shoes. We all want the world to think we are ok! We are living the dream, and are certainly full of Luck! But, once you look in, things may be more unlucky. By the end of this book you will walk away realizing, “How Lucky You Are”! I bought HLYA, honestly, because Ms. Kusek-Lewis is a debut women's fiction author and I'm doing my best to find and support new authors. I feel this book started off a little slowly, as some books do, getting some backstory in and setting the scene for plot complications down the road. The first 100 pages or so took me longer to get through for that reason. Nothing bad, I didn't dislike the characters or the premise, it just took me awhile to settle in and really INVEST in them. 1/3 to 1/2 way I bought HLYA, honestly, because Ms. Kusek-Lewis is a debut women's fiction author and I'm doing my best to find and support new authors. 1/3 to 1/2 way through the book all of that changed. I actually read the second half of the book in a single day because I couldn't wait to see what happened. HLYA is a terrific book about female friendships, relationship issues, and the danger of believing the 'grass is always greener'. I feel like I've been through a train wreck, and it'll take me a few days to recover from this riveting story of love, lies, abuse, and the ties that bond friendships together. Goodreads Description- In the tradition of Emily Giffin and Marisa de los Santos, HOW LUCKY YOU ARE is an engaging and moving novel about three women struggling to keep their longstanding friendship alive. Waverly, who's always been the group's anchor, runs a cozy bakery but worries each month about her mounting debt. Kate is married to a man who's on track to be the next governor of Virginia, but the larger questions brewing in their future are unsettling her. Stay-at-home mom Amy has a perfect Goodreads Description- In the tradition of Emily Giffin and Marisa de los Santos, HOW LUCKY YOU ARE is an engaging and moving novel about three women struggling to keep their longstanding friendship alive. Waverly, who's always been the group's anchor, runs a cozy bakery but worries each month about her mounting debt. Kate is married to a man who's on track to be the next governor of Virginia, but the larger questions brewing in their future are unsettling her. Stay-at-home mom Amy has a perfect life on paper, but as the horrific secret she's keeping from her friends threatens to reveal itself, she panics. As life's pressures build all around them, Waverly knows she has some big decisions to make. In doing so, she will discover that the lines between loyalty and betrayal can become blurred, happy endings aren't always clear-cut, and sometimes you have to risk everything to gain the life you deserve. Waverly owns a bakery, and is having financial trouble, Kate’s husband, Brendan, is running for governor of Virginia, and Amy is married to a doctor, Mike, and is a stay-at-home mom. They are all having problems in their relationships, and they aren’t really talking to each other anymore, at least not about anything important. Every time Waverly tries to talk to one of her friends about her problems, they are too preoccupied with their own lives to listen. But, suddenly things happen to both Amy and Kate that make Waverly realize how good she has it. She thought her friends had perfect lives, but she had no idea how bad things really were for them. Many reviewers criticize how each of the three women in the book can't and don't talk to each other about their problems and take off points because the author doesn't have these close friends talk to each other about what is really going on. I don't agree with these reviewers. We all want to have the idyllic life, the white picket fence, the perfect family. When things don't go as planned it is often difficult to talk to your friends who you perceive as having that perfect life. Its also very hard to realize that everyone has their own crisis's and secrets and its almost hardest to talk about these problems to your best friends. You don't want to be the only one with problems. As women we are raised that we should take care of our problems ourselves. This was a major theme in the book. How women are raised differently than men and how we deal when problems come up in our lives. We often hold them in to our own detriment because we don't want to be the "only one" with problems. However that thinking isn't logical. Everyone has problems but we often think that the grass is always greener on the other side...but that is never the case. I think the author did a wonderful job of creating three very different female characters who are each flawed in their own unique way. I also like how she shows the reader how each woman responds to their own problems in such a personal and individual way. It is also interesting to see how she portrays the men in the book and how differently they deal with problems when compared to the women in the book. There’s nothing I love more than books that showcase the friendships of women. I love my friends and cherish each one of them. In HOW LUCKY YOU ARE, Waverly, Kate and Amy are supposed to be best friends. Supposed to be. All three of them are keeping things from the others. Big things. And Waverly~~she’s keeping secrets from more than just her best friends. Secrets. They can eat you alive. This book absolutely frustrated me. I wanted to knock on Waverly’s door and make her sit down and listen to a There’s nothing I love more than books that showcase the friendships of women. I love my friends and cherish each one of them. In HOW LUCKY YOU ARE, Waverly, Kate and Amy are supposed to be best friends. Supposed to be. All three of them are keeping things from the others. Big things. And Waverly~~she’s keeping secrets from more than just her best friends. Secrets. They can eat you alive. This book absolutely frustrated me. I wanted to knock on Waverly’s door and make her sit down and listen to an old lady who has been there and done that. (Okay~~I’m not THAT old.) But still. And Amy~~I wanted to tell her that she’s not alone and that she is worth more. And Kate~~I applaud Kate. Sometimes. Sometimes she can be a bit of snot. So, why did I keep reading it even though I was frustrated? Because it was GOOD. When a book can make you feel something~~it’s a good one. "My entire adult life, I've been struggling so hard, searching for this sort of higher, enlightened perfection. But really, after talking to Margaret and watching her and Davis together, I realize that all I need to do to make my parents proud - to make myself happy - is to stop second-guessing my blessings, stop thinking that the grass is always greener, and know how lucky I am to have my particular messed-up, mucked-up life." We all have those moments in our lives when we look at a friend, or a "My entire adult life, I've been struggling so hard, searching for this sort of higher, enlightened perfection. But really, after talking to Margaret and watching her and Davis together, I realize that all I need to do to make my parents proud - to make myself happy - is to stop second-guessing my blessings, stop thinking that the grass is always greener, and know how lucky I am to have my particular messed-up, mucked-up life." We all have those moments in our lives when we look at a friend, or an acquaintance, or even a stranger on the street and think how lucky they are in their lives. If only we had their money, or their family, or their husband, or their kids, well then life would be awesome. If only we could walk in their shoes, give away our own troubles, and live the "charmed" life they seem to have, then everything would be amazing. I'm guilty of it; I'll confess right now - from the outside looking in I sometimes wonder why other people are so very, very lucky. Why can they afford the amazing house? Why can they have the perfect Norman-Rockwell-painting family gatherings and the great looks and the astounding intellect? Why not me? I don't think often about the people looking in, at my own life, and thinking the same things, but I'm pretty sure they're there. How Lucky You Are is a tale about coming to terms with our own lives, and realizing how lucky we are to have the blessings that come with our own particular problems. It follows the life of Waverly, who was orphaned early and lives in the home her grandmother left her with her boyfriend Larry. She's sinking in a sea of money troubles and on the verge of losing her business, a bakery which is the gathering point, often, for her circle of friends, which includes happy homebody Amy, with the perfect home and daughter - yeah, her husband seems like a bit of a dud, but she's perpetually upbeat so must have an awesome life - and wealthy Kate, who comes from an old-monied family and is married to the shoe-in for the next governorship of Virginia - and Kate has everything she could ever wish for, so must also have an awesome life. Waverly feels a bit sorry for herself. She doesn't know how to admit the financial issues she's having to her boyfriend. She doesn't seem to know why they aren't married yet, though they've been together for ten years. She misses her mom and dad, and her grandmother. She doesn't have Kate's style or Amy's disposition, and finds herself to be sorely lacking. Until she starts to unravel what is really going on in the lives of her friends. It's true that once you become married, there's a certain door that shuts with your girlfriends. You become less open. You are a team, along with your husband, and part of what makes for a successful marriage is not airing your dirty laundry outside of it. Unfortunately, that also camouflages situations where a woman might really need the help of her friends. Where she might be quietly desperate for someone to understand what is going on in her world, but is unable to reach out, to cross that invisible barrier. "It's as if there's a force field around me that divides our realities: On the outside, it's swirls of springtime and the smell of sun in the air. But inside, here where I stand, it's darkness, damp cold, and the kind of piercing quiet that makes you want to scream. (...) Then it hits me: This horrible, "nobody knows what's happening to me" feeling must have been exactly how Amy felt, all the time." I loved this book. It's real, and very honestly written. It has amazing characters, sparkling dialogue, poignant life lessons and delicately handles some of the most emotionally wrought issues that women face. It's a beautiful book that I can honestly and thoroughly recommend to every one of my female friends. I still haven’t recovered from reading this book. And I mean that in the nicest most complimentary way possible. It’s one of those books that haunts you, enchants you, grips your heart, your soul, your mind, until finally when the pages stop clicking, you can do nothing save stare at the wall for a good ten minutes and wonder what the heck just happened. This is a new author to me. I didn’t really know what to expect. Her writing has been compared to Emily Giffin, who I love, so I kind of knew what to expect as far as content, but wow was I blown away. It exceeded my expectations and will be a book that I recommend for years to come. We follow loveable bakery owner Waverly. She has lived with her boyfriend for years, content with her life, except she has a secret–debt. And she hasn’t told her wonderfully loyal and secure boyfriend, something that hangs over their relationship the entire book. Amy, one of Waverlys best friends, appears to have the perfect little subdivision life. A husband, a perfect house, a dog, and a way too optimistic attitude, but everything is not always as it seems, she too has a secret. And finally, we meet Kate. Beautiful, rich, Kate. The girl you looked up to in high school that wasn’t necessarily mean to you but above you, if you get what I mean. She’s arrogant, self assured, but also fiercely loyal. On the outside she’s perfect, a soon to be politicians wife, beautiful, rich, I mean really what else could you want? The book is given through Waverlys point of view. She has financial struggles of her own but refuses to rely on anyone. Her boyfriend is amazing, yet she doesn’t want to add stress to his life, part of this is that she has major trust issues. Her parents died leaving her an orphan at a young age and she’s left with nothing. She wants to make it on her own and frankly gets tired hearing of her friend Kate complain about her perfect life. To make matters worse, her other best friend Amy has suddenly shut down, not to mention the fact that mysterious bruises have started appearing on her person. This book gets women. It understands the typical mindset we have when looking at other peoples lives. “If only I had that job, if only I had that much money, if only I had perfect legs.” I mean seriously, she hatches out every single selfish thing any woman has ever thought and lays it across the table. Experiencing life is key in this book. Joy, is also key. How can you fully live life or experience it for that matter when you are constantly living up to false expectations you’ve given yourself? Life is not always as it seems and the grass is not always greener on the other side. Although this is not my typical cup of tea, I found myself staring cross eyed at my kindle until it was finished. It was a beautiful, heartfelt masterpiece. If Miss Lewis continues to write such emotional stories, she will soon be a household name. You’ve heard it here folks! Waverly owns a sweet little bakery, but is secretly struggling to not lose everything. Here she is at 35 trying not to lose her business, her house and not able to share the information with anyone. She struggles with feeling like a failure—she and her long term boyfriend aren’t even married. Her best friends have it so together. Amy is just as sweet as they come and is married to a doctor, lives in the ‘white picket fence’ house on a cul-de-sac and has an adorable little girl, Emma. Kate is a k Waverly owns a sweet little bakery, but is secretly struggling to not lose everything. Here she is at 35 trying not to lose her business, her house and not able to share the information with anyone. She struggles with feeling like a failure—she and her long term boyfriend aren’t even married. Her best friends have it so together. Amy is just as sweet as they come and is married to a doctor, lives in the ‘white picket fence’ house on a cul-de-sac and has an adorable little girl, Emma. Kate is a knock-out with the world at her feet. Born into wealth and power, gave up her job as a successful travel writer to marry the man of her dreams Brendan. Not only is Brendan the man of Kate’s dreams he is running for governor of Virginia—how is that for picture perfect? Waverly is the anchor of their friendship. She begins to see a slow unraveling of their friendship, Waverly puts herself out there crossing some friendship lines and what she finds makes her stop and realize how lucky she is. Realizing looking at someone’s life from the outside you can assume they are the lucky ones, but you don’t really know what goes on behind closed doors—not even your best friends. How Lucky You Are, is a testament to the power of friendship and a story of finding happiness is being true to yourself and not living the ‘life’ others think you should. How Lucky You Are is read through the eyes of Waverly. I’ll be honest and really wasn’t sure about this book. It’s a new author and I’ve read so many books on friendship lately, I just wasn’t really excited. What a mistake that was! I loved this book! I believe the topics in the novel are relevant! This looked at friendship in a way I believe is so real, not we tell each other everything—but real. We want our friends to think we have it together. We open up to each other this much, but maybe not all the way. Keeping part of ourselves hidden. And the power of getting real. I related to Waverly in a way that surprised me. I’m very open and honest with my husband, whereas Waverly holds back from her boyfriend, Larry. Where I connected with her was some of those underlying feelings she faces when dealing with the effects of having lost her parents. I know since losing my mom there is a huge part of myself I keep very guarded with other women. I don’t want to open myself up to lose someone again. I really got that about her and could see the issues it causes her. The ending leaves itself open to come back and see these characters again (hint, hint Kristyn!). 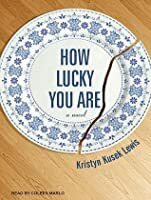 "How Lucky You Are" by Kristyn Kusek Lewis is the story of three women - Kate, Amy and Waverly, who are all in their mid-30s and each facing their own challenges in their relationships. However, for these women, from the outside looking in, each feels that the other two have the most perfect relationships. The story is narrated by Waverly, who owns a local bakery in Maple Hill, Virginia, just outside of Washington, D.C. Waverly has lived in Maple Hill her entire life, and grew up with Kate, whos "How Lucky You Are" by Kristyn Kusek Lewis is the story of three women - Kate, Amy and Waverly, who are all in their mid-30s and each facing their own challenges in their relationships. However, for these women, from the outside looking in, each feels that the other two have the most perfect relationships. The story is narrated by Waverly, who owns a local bakery in Maple Hill, Virginia, just outside of Washington, D.C. Waverly has lived in Maple Hill her entire life, and grew up with Kate, whose husband is running for Senate in Virginia. Waverly and Kate met Amy after graduating from college, when the lived in the same Adams-Morgan apartment building in Washington, D.C.
Waverly, who is the only one of the three that is still unmarried, is living with her long-term boyfriend, Larry, a curator at the Smithsonian. She looks at Amy and Kate and thinks that they really do have the life. Waverly has been questioning her relationship with Larry and wondering why they haven't gotten married, all the while shouldering the burden of her failing business alone. After an annual trip to Florida with Amy and Kate, Waverly starts to feel that perhaps all is not as well with her friends as she had thought, and she starts digging in to see what's below the surface in the lives of her two friends. What she discovers is quite shocking. This book did not impress me at all. The writing was mediocre, the characters were annoying, and the plot was boring. It was okay - a very fast read. The point of the book was good but it got tedious about half way through. If she asked one more person how they were and they said "I'm fine" it would have been total creative writing. It was rather predictable, but again, the over all theme of valuing your friends and realizing the grass is not always greener is a good one. I wouldn't read it again, but it was worth reading. Warmly written story about the joy and perils of female friendships. Very easy read with a compelling storyline that you'll find hard to put down. Would highly recommend as a thought-provoking read for book clubs. and a few twists, but for me, the characters remained pretty one-dimensional and the pace dragged during Waverly's tedious monologues. This is an amazing read about friendship. It is not your typical friendship story. I was very impressed with the pace of the story and the characters. Great read! Although parts of this novel were cliched or predictable, it was saved by the warm, engrossing writing syle. It was just what I was in the mood for: a friendly, charming story of friendship! Interesting read, but there were things that bothered me. Three women, friends for years, start having problems in their personal lives (or have had for years). One of them is having issues that I think the others would have noticed for sure...and they claim to be besties, but they don't share anything personal. Their decisions annoyed me sometimes. this was a good read. quick and had a little more substance than your typical chic lit. I'd recommend. Loved this book, very intriguing and interesting all the way through. Will look for this author more. My new novel, HALF OF WHAT YOU HEAR, is available now in bookstores everywhere! I'm the author of SAVE ME (Grand Central, Dec 2014), a novel about two doctors, a tragic accident, and the power of forgiveness, and HOW LUCKY YOU ARE (Grand Central, Sept 2012), a novel about three women and the growing pains of their enduring friendship. Both books reached #1 on Barnes & Noble’s Top 100/Bestsellin My new novel, HALF OF WHAT YOU HEAR, is available now in bookstores everywhere! I'm the author of SAVE ME (Grand Central, Dec 2014), a novel about two doctors, a tragic accident, and the power of forgiveness, and HOW LUCKY YOU ARE (Grand Central, Sept 2012), a novel about three women and the growing pains of their enduring friendship. Both books reached #1 on Barnes & Noble’s Top 100/Bestselling NOOK Books and HOW LUCKY was a Target Emerging Authors Pick, a Working Mother "Five Best Fall Books" and Parents Magazine "Mom Must-Read." A former magazine editor at publications including Glamour and Child, I've been writing for national publications for nearly twenty years. My work has appeared in dozens of publications including the New York Times, O: The Oprah Magazine, Real Simple, Reader’s Digest, and many more. I live in the Washington, D.C. area with my family.